Our four month residency in the museum consisted of a four part panel series, screenings, live broadcast tapings, special site specific performance commissions, and performances. We set up residency in the museums auditorium as well as sixth floor studio space. All content was documented and broadcast on our program on Manhattan Neighborhood Network (MNN). mapping.. etc), encounter a new and evolving set of obstacles that surround intellectual property, technical issues, censorship, and privacy rights, and at times criminal intent. Focus for this panel surrounds cable access and lo fi broadcast networks. Topical issues surround a suffocated media outlet and methods of survival, identifying audience and public involvement, access and distribution. Panelists: Jamie Mohr Cable Access, VT, Bunnybrains), Chuck Stern (MNN Network), Ashby Lee Collinson (Princess Dies), Jaime Davidovich (Live! 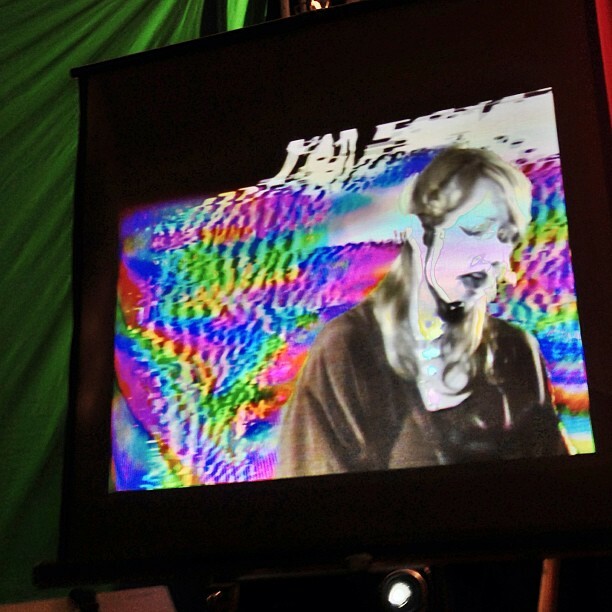 Show), Nancy Cain (Videofreex). Participants: Shawn O Sullivan, Driphouse, JG Thirlwell, Nat Roe, Naval Cassidy, Cult of Youth, Dana Bell and Sam Consiglio, Greg Zifcak, Don Stahl and Ted Shumaker. Panels broadcast on Harvestworks website and live streamed through Free103.9 web radio.